To frugally, effectively, and sustainably enhance mental health literacy of students and educators and to help increase access to care. Approximately 1 in 5 youth worldwide will experience a mental illness before they turn 251. This makes adolescence a crit­ical time for mental health promotion, prevention, early identification, and intervention. Not addressing these issues leads to negative short- and long- term outcomes. Mental health literacy is foundational for all mental health improvements. 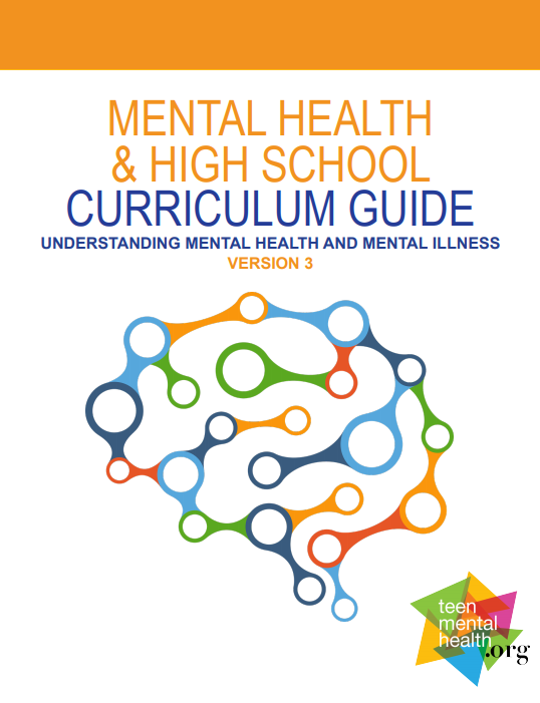 The Mental Health & High School Curriculum Guide is the first and only evidence-based Canadian mental health literacy curriculum resource designed for use in schools. Building on existing strengths, it is delivered by classroom teachers in a sustainable and cost-effective manner. The curriculum provides a complete set of educational tools that research has demonstrated to increase mental health lit­eracy of both students and teachers. A one-day face-to-face learning session for classroom teachers, and a two-day train-the-trainer workshop for key individuals builds regional capacity for program sustainability. To date, to our knowledge, over 3000 schools in 7 Canadian Provinces have been applying the Guide. Mental Health Literacy (MHL) is foundational for mental health improvements, and schools are naturally equipped with the capacity to foster MHL. This school-related mental health work fits into the development and support of a horizontally integrated, system improving, sustainable and frugal approach to enhancing mental health care for young people and their families: The Pathway Through Mental Health Care model. The Pathway through Care model proposes a simple innovative method for integrating education and healthcare opportunities that would result in youth, teachers, families, student services providers, primary care providers, and even mental health professionals becoming more mental health literate while concurrently establishing efficient access to effective mental health care. This mental health literacy work is based on applying best evidence demonstrated resources and interventions in classrooms by trained classroom teachers that are designed to build on and improve existing educational system MHL capacity in a sustainable, pedagogically valid and cost effective way. This work is not dependent on fidelity of implementation as it is a pedagogical method common to everyday classroom teaching and thus fits how all school curriculums are delivered globally. The Guide is a classroom ready, evidence-based resource consisting of 6 modules (freely available online) that teachers learn how to apply in their classrooms during a one-day training period. Teachers then teach the material in their classes. This simple method improves mental health literacy for both teachers and students simultaneously. The curriculum resource is embedded in the school curriculum and new teachers are trained by a local trainer’s team, thus providing sustainability. As of October 2017 this training is available online, certified by the Faculty of Education at the University of British Columbia as accredited teacher continuing professional education. Each module includes a full suite of teaching materials including lesson plans, core and supplementary learning resources (PowerPoint presentations, animated videos, web-based links, printable PDF format resources, and other materials). These materials can be downloaded from the Resources section. The teacher training in the classroom application of the resource is conducted through teacher trainer groups embedded in either school boards or in a Provincial team. These teams receive a three-day train-the-trainer session from Dr. Kutcher and his team. Once local training teams are established, they provide the one-day training on the classroom application of the Guide to teachers, usually during existing Professional Development (PD) days. This has proven to be an efficient and inexpensive method for scaling out the intervention across large educational systems. Over two years, Dr. Kutcher and his team have also been conducting a semi-structured formative evaluation of the Guide materials and the classroom application of the Guide. The information collected from teachers and trainers has led to the development of a “Chair Certified Resources” (CCR) team of educators, students, parents and mental health professionals whose job is to vet potential mental health literacy resources for their accuracy and pedagogic suitability for classroom use. This resource list was made freely available to all Canadian educators in December 2015/January 2016 and some of its components will be added to the online teacher resources that support the classroom application of the Guide. Additionally, these data have been used to update the Guide and classroom ready modules to the current version which has as of July 18, 2017 been made freely available to all educators on the website. The Guide is designed to be easily embedded into existing educational systems. It is not a program that is added to or parachuted onto already stretched school environments; rather it builds on, enhances and sustains existing educational capacity. The Guide does not require fidelity of implementation to achieve successful outcomes (rather it uses teacher determined flexible strategies to teach the content), and is easy to implement (lesson plans and classroom ready resources are embedded in the Guide). The Guide addresses both teacher and student mental health literacy concurrently, which to our knowledge is the only such approach ever successfully documented in Canada as well as all other locations where research has been conducted. The materials are freely available online. The method for scaling out the intervention across large educational systems has been effective, however, it is limited by trainer availability and is constrained by Professional Development day schedules. This intervention is now being applied in most of Canada’s provinces. A number of Provinces are moving to fully embed the Guide and its teacher training programs, and jurisdictions in most other Provinces and Territories have initiated discussions to explore a similar opportunity. An early phase demonstration is underway in the USA and will be undertaken in Finland, Romania, and Portugal in 2017. It has been successfully applied in low-income countries including: Malawi, Tanzania, Nicaragua and is being introduced to Guatemala and Bangladesh. The cost of implementing the innovation is minimal. It includes the cost of training the trainers (2 days); one day of training for teachers (during Professional Development days) and all online resources are free. Costs vary depending on the location. To date, to our knowledge, over 3000 schools in numerous Provinces (British Columbia; Alberta; Saskatchewan; Manitoba; Ontario; New Brunswick and Nova Scotia) have been applying the Guide. The impact of the Guide has undergone extensive evaluation and research in Canada and elsewhere. The evaluations dataset is now available from 6 different Canadian provinces, and additional investigations in these and other jurisdictions are currently underway or planned (see Resources section for related peer-reviewed publications). Briefly put, this approach has been robustly demonstrated to SIMULTANEOULSY enhance the mental health literacy (MHL) of both teachers and students in all studies pertaining to improvement of knowledge and decrease of stigma. Measures of change have been highly significant, with measures of increased knowledge highly impactful and measures of decreased stigma moderately to highly impactful. Furthermore, the two Canadian studies that have examined the persistence of these positive impacts have demonstrated that these improvements in both knowledge and stigma have been sustained over time. This finding, to our knowledge has never before been demonstrated in this population for a MHL intervention. And, these findings are similar for both teachers and students. Another study (a randomized controlled trial in the Ottawa region) that compared the application of the Guide against that of an existing school mental health curriculum reported significantly better outcomes on knowledge and stigma among students who received the Guide. This study also showed the Guide’s positive impact on help-seeking intentions in students receiving the Guide intervention. Similarly positive robust results have been found in a prospective cohort study of pre-service teacher trainees in British Columbia and in a large cohort of teachers from three different school boards in Alberta. Further independent studies are also ongoing in the Province of Manitoba and are being planned for other Canadian jurisdictions. Kessler RC, Berglund P, Demler O, Jin R, Merikangas KR, Walters EE. (2005). Lifetime Prevalence and Age-of-Onset Distributions of DSM-IV Disorders in the National Comorbidity Survey Replication. Archives of General Psychiatry, 62 (6) pp. 593-602. doi:10.1001/archpsyc.62.6.593. Dear Mike, thank you for your note and obvious passion in this area. We appreciate your support of our work and as we move forward it is essential for us to ensure that all people with your interests are fully informed about our innovations. The link that you provided to an Ontario document on stigma is not the same as our work in mental health literacy (MHL). We have addressed MHL as comprised of 4 distinct but related domains: obtaining and maintaining good mental health; understanding mental disorders and their treatments, decreasing stigma and enhancing help seeking efficacy. We have done this in a unique manner - embedding a curriculum resource that can successfully and sustainably improve outcomes for students and also for teachers. In addition, this innovation builds MHL capacity within the education system and does so in a frugal and sustainable way. As we understand that you are also interested in these outcomes, we trust that you will be pleased that our approach has been so successful. In addition, at the systems level, we have formed partnerships with school districts, institutions of higher learning, not-for-profits and government ministries globally to ensure that the resource is being applied at the appropriate level to meet curriculum outcomes. This builds on and enhances existing identified mental health goals. The resource was developed to be flexible and frugally implemented. This is also unique as it does not rely on fidelity of delivery, but rather on existing pedagogical processes. That is why the outcomes are so similar regardless if the intervention is applied in high or low resourced and socio-culturally diverse jurisdictions. We encourage local adaptation of the materials so that the resource can better reflect the community in which it is being applied. We also seek ongoing feedback on the resource and are responsive to the feedback we receive. For example, this resource has undergone a number of updates. The most recent update included detailed feedback not only from Canadian educators but also from key stakeholders globally. We are sure that you also support how important ongoing up-to date and easily accessible professional development is for educators, and how important this is for application to students and maintenance of effective sustainable impact. We utilize a “waterfall” model of development of training teams that has been shown to be an effective approach, not only in Canada but in other countries as well. However, we are always trying to improve access for educators to this evidence-based material and in particular we are trying to improve access for educators in rural and remote areas. Therefore, recently we partnered with the Faculty of Education at the University of British Columbia, to create and apply yet another innovative component to this. 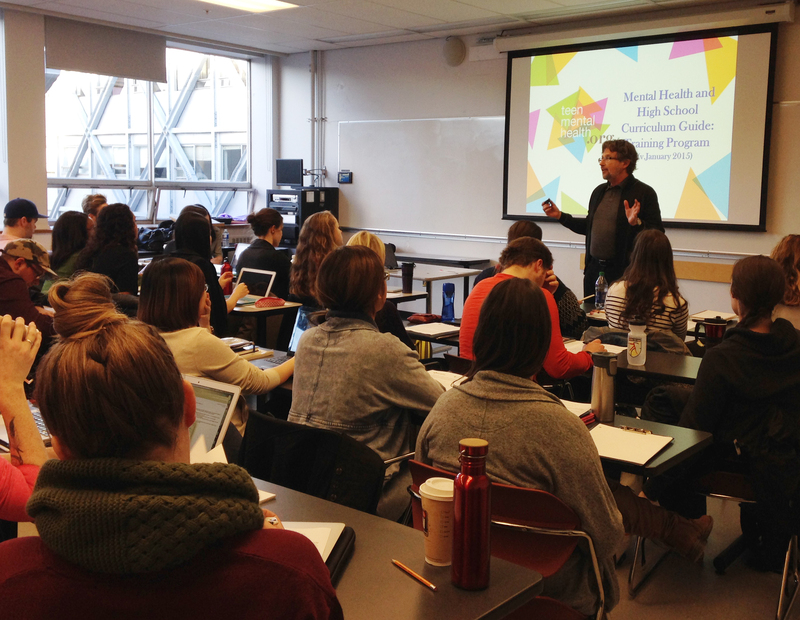 Just a few weeks ago, an online course was launched through the University of British Columbia for educators to undertake comprehensive self–directed learning on the resource and increase their mental health literacy in the comfort of their own homes! Here is the link: http://pdce.educ.ubc.ca/mentalhealth/. To our knowledge, this is the first globally available, evidence based, online MHL professional learning intervention for educators. This innovation will be easily accessed across Canada and globally. The research and evaluation evidence collected to date (in Canada and elsewhere) demonstrates that this intervention has substantial, significant and sustained positive impact on numerous mental health related outcomes for both students and teachers. Some of the articles on these impacts are listed under the Resources tab on the MHIN page. If it would be helpful we can send you other articles and share more detail on how different provinces and countries are succeeding at sustained implementation of school based mental health literacy. For first hand impact on student’s lives check out this news piece from North Vancouver on implementing the resource in the classroom. https://globalnews.ca/news/3876529/north-vancouver-mental-health-course/.